your participation in this Labor Day Weekend fundraising event. The evening before the Las Campanas Compadres Triathlon and Kid’s Race. Entry filed under: 2015 fUNDRAISING, Fundraising for non-profit group, Labor Day Weekend Events. 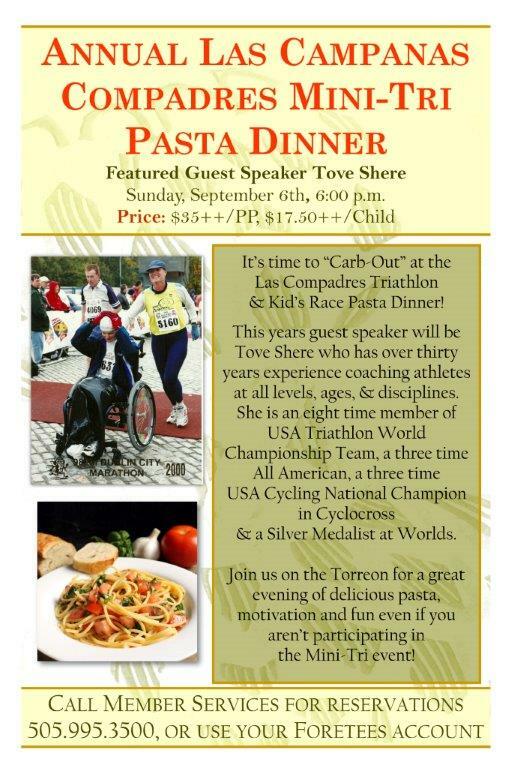 Tags: Pasta Dinner, Pre Triathlon Dinner, Torreon Portal, Tove Shere. PREVIEW OF THE EXTRAORDINARY ONLINE AUCTION ITEMS	It is THE Weekend To Be a Compadre!